How to Choose a Mattress. Frequently Asked Questions. What are the different mattress sizes? Most common for children’s rooms, daybeds, trundle units and hideaways. Approximate width per person: 39″. Is generally used in college dorm rooms and is 5″ longer than a standard twin. Bedding may be harder to find and available only a limited variety of styles. Approximate width per person: 39″. Full size beds are only 15″ wider than Twin beds. This won’t leave much elbow room for 2 adults (each will have only 27″ of width vs. 39″ in a Twin bed). Also, a Full bed is only 75″ long which may be too short for some adults. But, this size is a good option for a guest room or as a child’s step-up mattress. Approximate width per person: 27″. Full Extra Long size beds are 5″ longer than Full beds. Bedding may be harder to find and available only a limited variety of styles. Approximate width per person: 27″. Currently the dominant size bed in America, Queen Beds are 6″ wider (and 5″ longer) than a Full size bed. These added inches can make all the difference in comfort, but each adult still has 9″ less than the width of a standard Twin bed. However, it’s a good choice for guest rooms and smaller master bedrooms. Can use standard pillows or the slightly larger queen size pillows. Approximate width per person: 30″. King beds are growing in popularity. King is about 16″ wider than a Queen bed. Both are about 80″ long. The Eastern King is the only bed to give each person the same width as a Twin bed. In fact you can push 2 Extra-Long Twin beds together to be the same size as an Eastern King. This is a good way to have a versatile guest room (use 2 twins separately or push together to make a king bed for couples). An Eastern King bed comes with one mattress and two half-width box springs to be more manageable when moving. Approximate width per person: 38″. California King is 12″ wider than a Queen bed but adds 4″ in length. This may be a better choice for taller adults. This size is sometimes known as the “Western King”. Bedding may be labeled either “California King” or “Western King”. A California King bed set comes with one mattress and two half-width box springs to be more manageable when moving. Approximate width per person: 36″. What are the Full XL and Twin XL sizes? The Full XL bed is 54″ wide and 80″ long. It is the same width as a regular full bed, but has 5 extra inches of length. Twin XL beds, or Extra Long Twin beds, are commonly found in college dorms and hospitals. These beds are the same same width as a regular Twin bed, only they provide 5 extra inches of length measuring 39 x 80 inches. What is the difference between King size and California King size beds? California King size is 4″ longer and 4″ narrower than King (Eastern King) size. What are the Twin/Full and Queen/King sizes? Twin/Full size is usually applied to a adjustable metal bed frames. The standard size of the Twin mattress is 39″ x 75″ and the standard size for Full mattress is 54″ x 75″. Therefore, adjustable metal bed frames can be used for a Twin mattress and also can be expanded to accommodate a Full size as well. Queen/King size is also usually applied to a adjustable metal bed frames. The standard size for a Queen mattress is 60″ x 80″ and the standard size for a King size mattress is 76″ x 80″. Once again, in this case the adjustable metal bed frame can be used for a Queen mattress and can be expanded to accommodate a King size mattress as well. 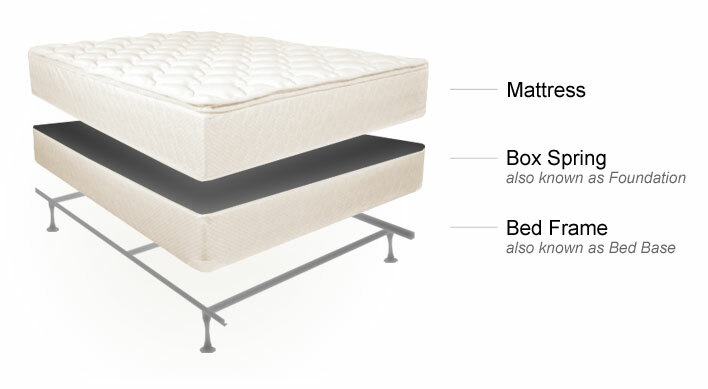 What are the Mattress Set Components? Why do I need a Box Spring? A box spring along with a mattress are engineered to work together as a set. The foundation takes a lot of the nightly wear and tear, and contributes to the bed’s overall comfort and support. It is recommended that you purchase a matching box spring for each conventional mattress you get. Most of the manufacturers make universal foundations that work with all the mattresses they handle. Some collections come with special made box springs. Keep in mind that box springs may vary in sizes and shapes, so the wrong foundation will impede comfort and reduce the useful life of your new mattress. What is a “Split Box Spring”? A split box spring is a regular mattress foundation made up of two separate pieces placed side-by-side. Split box springs are made for delivery purposes. If your foundation is needed to be delivered to the place with tight doorways, staircases or narrow corners consider buying a split box. Queen and Full box springs come in both whole and split types. All King size mattresses use split foundations. Only order split boxes if necessary, since they cost more than a one piece box. Do you sell mattresses free of chemicals & toxins? All mattresses must be flame retardant as required by a state law. Both conventional and futon mattresses are treated with borate acid (a fire retardant) by the fire standards. If you’re interested in buying a chemical free non-toxic mattresses and have a doctor’s approval we can order a custom made 100% organic mattress with no borate acid for you. Please call (877) 388-6652 for more information. What should my prescription for a chemical-free mattress say? If you want to purchase a chemical-free (borate-free) mattress, you will need to send us a doctor’s prescription (Rx) or a letter stating that you need a chemical-free mattress. What are the safety precautions I need to know? The mattresses we sell are NOT fire-proof. Although the mattresses meet fire safety standards issued by the U.S. Consumer Product Safety Commission, they will burn if ignited. Compared to older mattresses, your new mattress will, if ignited, burn more slowly and less intensely, giving you more time to escape. Don’t smoke in bed. This is a common cause of fatal bedroom fires. Keep matches and lighters away from children. Playing with fire can be deadly. Using candles in a bedroom is strongly discouraged. Even a small candle can ignite a deadly fire. Keep space heaters far away from beds and other flammable items. Follow all of the space heater manufacturer’s instructions and warnings. Don’t run electrical cords under your bed or trap them against a wall. Heat from cords can build up and cause a fire. Avoid placing lamps where they can fall on the bed. Don’t sleep with a baby or let a baby sleep in an adult bed. Babies can suffocate or be strangled if trapped between a mattress and a wall or bed frame, or if an adult rolls over them. Discard the plastic wrapping on your mattress. A child or pet can become entangled and suffocate. Promptly dispose of old mattress to avoid a fire hazard. The mattress I’ve received is shorter/narrower than I had ordered. Why is that? Due to the size restrictions of our shipping methods, your futon may have been rolled, tied and wrapped in plain brown craft paper or carton for shipment to you. Because of this, your futon may appear to be a bit shorter and/or narrower than what you have ordered. This is normal and it will relax and “grow” in length and width, once it has laid flat and has been used for a day or two (the bigger ones may take a bit longer because they’ve been “squished” more). You can put the mattress on the frame right away. Open the mattress and leave it in a sofa position for a few days, that will help to break it in the middle. The mattress should open up to about 90% of it’s size within a few minutes and will stretch to it’s original size within the next 48 hours. Remember to flip and turn it regularly. The first month or so, every week is good, and after that, once a month is fine, or as needed. Spot-wash as needed and if possible a day in the sunshine now and then will work wonders for “sun-bleaching” and refreshing your futon/top mattress/cushion.